The development of Litigation Property Preservation Liability (LPPL) insurance in China was driven by the increasing level of civil litigation taking place. According to the Civil Procedure Law of China, before or during civil litigation, the plaintiff can apply to the court to preserve the defendant’s assets to ensure the plaintiff gets its money should they win the suit. To secure approval from the court, the plaintiff is required to provide the guarantee for the property preservation in case there is wrongful preservation which causes the economic loss of the defendant or any other party. Traditional methods of the involved party providing its own guarantee (letters of guarantee from commercial banks and sponsor’s guarantees, etc.) often fell short, and failed to meet the demands of judicial practice. The insured liability of LPPL relates to the damages that a court orders to be borne by the insured as a result of the loss incurred by the respondent due to a wrongful application for litigation property preservation by the insured. The China Insurance Regulatory Commission authorized the first pilot trial of LPPL insurance in Yunnan Province in 2012. Since then, LPPL products have become available from insurers in several provinces and cities across China. At the same time, more courts in China are recognizing LPPL as an acceptable litigation property preservation guarantee method, boosting the market for an insurance product that cannot be found anywhere else in the world. On November 7, 2016, the Supreme People’s Court formally established the legal status of LPPL insurance across the country. Since then, LPPL insurance has been developing much faster than before and has become an important new liability product in China. Litigation Property Preservation Liability insurance (LPPL) is a uniquely Chinese specialty insurance line that has grown strongly over the last few years. However, as more insurers have come into the LPPL market, premium rates have begun to fall sharply with pricing now frequently inadequate compared with the risk exposure. Worryingly, many insurers believe that LPPL is relatively risk-free because there have been very few large losses in the course of its short existence. In fact, because of the inherently long-tail nature of LPPL insurance, it can easily take more than two years after a policy is issued for claims of wrongful preservation to be reported. The loss picture is developing, however, with several large LPPL claims on insurance underwritten in 2015 and 2016 being reported throughout 2018. At the same time, many new situations and problems have emerged that require corresponding countermeasures from LPPL underwriters. To summarize the problem in a nutshell, while premium rates have been falling, loss control has been getting less strict. One of the most common sources of cases involving LPPL have to do with equity disputes. They can be divided into four main dispute categories: shareholder capital contribution; equity ownership confirmation; equity transfers; and shareholder rights. Shareholder capital contribution disputes are disputes arising from shareholders investing capital and assets into a company while in the process of establishing a company or increasing their investment. The confirmation of equity ownership is essentially the confirmation of shareholder qualifications. In judicial practice, this type of litigation is a relatively common type of dispute and a more complicated type of litigation in legal and practical matters. Equity transfer disputes generally refer to disputes that arise during the transfer of equity, including disputes over the transfer of shares between shareholders, and disputes over the transfer of shares between shareholders and non-shareholders. Disputes over shareholder rights refer to disputes over what rights one or more equity owners of enterprise properties have, and in what manner the rights shall be exercised in the process of registering an enterprise in accordance with Corporate Law. As stated, the use of property preservation is more commonly seen in equity dispute litigation. Often the value of the preserved property is relatively high, especially in confirmation of equity ownership and equity transfer cases. At the same time, the preserved property does not necessarily have to be the equity itself. Bank deposits and real estate are more common. Corporate Law is the main applicable law for equity dispute cases, which tend to be much more complicated than general civil cases. They often involve multiple parties, and the legal risks of the cases are frequently hard to identify. Also, since the value of the preserved property is relatively high, it is easier to cause wrongful preservation and significant losses in these cases. To date, around ten large LPPL claims have been reported in the market, all from equity dispute litigation cases, with claim amounts ranging from 10s to 100s of million yuan. The largest settled case for wrongful preservation in history is reported to be the Tort Liability Dispute between Qingdao Zhongjin Company and Qingdao Yuneng Company. This case was finalized by the Supreme People’s Court on December 8, 2017 (Judgement No. : (2017) Supreme Court Civil Final No. 118): Zhongjin Industrial Company shall compensate Qingdao Yuneng Company for the loss of nearly 66.7 million yuan caused by the application for wrongful property preservation. The property preservation involved in this case arose from equity transfer litigation. The properties preserved mainly included deposits, pre-sale commodity housing, and land use rights. The loss caused by wrongful preservation, which was supported by the Supreme Court, consists of two aspects. One is the loss of interest on 120 million yuan, caused by the replacement fund being frozen for half a year. The second is the loss of interest on sales from the real estate development project, following it being delayed for one year due to the property preservation. 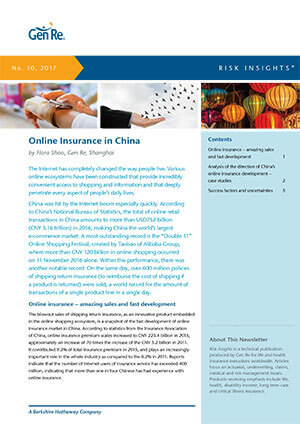 The legal risks contained in LPPL insurance are more complicated than those associated with traditional liability insurance lines in China. The insurer needs to comprehensively assess the insurance subject, the preservation subject, and the nature of the basic litigation case. However, owing to the low reported loss ratio of LPPL business and a competitive environment stimulating demand for faster insurance underwriting, the risk review methods adopted by insurance companies have become increasingly simplified. Reviews are often carried out by underwriters or internal legal personnel, but as these individuals may not have specialized legal knowledge or have insufficient experience in handling civil cases, they may not be able to truly manage the risk exposures involved. The Risk Review Form designed by an insurance company may result in a review conclusion that is not consistent with the actual situation due to the incompleteness of the risk items or the limited applicability of the form. Using simple scoring is inadequate, especially in complex litigation cases, which require specialists to conduct assessments based on the comprehensive analysis of case materials. For complex or large risks, insurance companies will entrust a professional law firm to conduct the review, but at the same time require them to do so in strict accordance with the Risk Review Form designed by the insurance company, limiting the subjective initiative of the lawyers. Additionally, such risk reviews are usually sent out in batches. The fee for each case is low and, to a certain extent, this has created an “assembly line” approach from lawyers. For example, lawyers might provide scores, rather than reviewing the cases analytically and cautiously. Or, further investigation for reasonable doubt isn’t conducted. Sometimes lawyers even ignore objective facts and provide high scores to satisfy clients who want to underwrite an insurance policy. Therefore, the professionalism and accuracy of the lawyers’ opinions are greatly reduced. This kind of risk review doesn’t just expose insurance companies to claims – it could create a moral hazard. When a respondent is unable to repay the debt or intends to seek extra benefits, the applicant and the respondent could collude with each other and invent an erroneous preservation, or exaggerate the loss due to the preservation, to cheat insurance companies out of money. LPPL insurance is a relatively long-tail business. It quite often takes several years from the issuance of a letter of undertaking to the filing of a claim. This requires insurers to properly track cases and to implement risk management after underwriting. However, according to our observations, many insurers have not established an ideal “post-insurance risk management” mechanism. After a pre-trial preservation case has been underwritten, the insured (property preservation applicant) fails to file a lawsuit or apply for arbitration within the statutory time limit and fails to apply for removing of preservation in time, resulting in loss due to wrongful preservation. After an in-litigation preservation case has been underwritten, the preservation applicant fails to notify the insurer and take reasonable measures to avoid the occurrence or deterioration of loss under the statutory situation that “should apply for removing of preservation in a timely manner” or other “high-risk situations”. The applicant fails to file a lawsuit or apply for arbitration within 30 days after the pre-trial property preservation measures have been employed. The arbitration court does not accept the arbitration application, or approves the withdrawal of the arbitration application, or takes it as withdrawal of an arbitration application. The arbitration application or request is rejected by an arbitration award. Other circumstances in which the People’s Court dismisses the litigation, approves the dismissal of a lawsuit or takes it as a voluntary dismissal. The suit or claim is rejected by another People’s Court. Other circumstances allowing the applicant for property preservation to apply for removing of the preservation. If the applicant for the preservation fails to apply to the People’s Court to remove the preservation in time, they will have to compensate the loss suffered by the preserved due to the property preservation. The preserved or the interested party proposes changing the preserved property or requests to handle the subject matter of the controversy on its own and have the cash equivalent preserved under the supervision of the court. The applicant for preservation does not agree without good cause. The applicant for preservation, the respondent of preservation, and the interested party believe that the execution of the preservation ruling violates the legal provisions and submits a written objection. The People’s Court preserves property other than the subject matter of the dispute, and a third party is dissatisfied with the execution of the preservation ruling or the process of the preservation ruling implementation, and files a written objection to the preserved property based on the substantive right. Insurance companies should take the legal risk review process for LPPL business seriously, selecting and training risk reviewers through multiple channels. They should focus on developing their internal professional capabilities, but also consider using external resources to properly handle LPPL business under the premise of balancing costs. LPPL business involves cases with complicated subjects and legal relationships. The diversity and complexity of the risks determine not only that the risk review of LPPL business rely more on the professional initiative of specialists, but also that the risk reviewers have relevant legal expertise and experience. At present, many insurance companies use internal legal personnel to conduct their LPPL business risk reviews. This is problematic for several reasons. First, the internal legal personnel are not full-time underwriters. They have to undertake another company’s legal work and cannot be in two places at once. Secondly, the basic legal cases involved in LPPL business are usually various types of civil and commercial cases. Legal personnel in insurance companies are more exposed to insurance cases rather than civil and commercial cases. A lack of direct experience will affect the accuracy and efficiency of the risk review. The party most suited to conducting risk reviews should be lawyers or judges with many years of experience in civil and commercial cases. In this regard, insurance companies should consider establishing a risk review legal team specialized in LPPL business, selecting and hiring through open tendering or competitive negotiation. We recommend: increasing the number of law firms in the pool; freezing fees by signing cooperation agreements, and; clarifying risk review requirements and accountability to make the best use of external review lawyers. Of course, in the long run, as the business grows, insurance companies should build their own LPPL risk reviewer teams. We have found several insurance companies in the market that have successfully established one of the following two risk review models which deserve our encouragement and strong recommendation. First, personnel with legal backgrounds can be introduced to engage fully in the risk review of the liability insurance, with their review ability improving continually through case study and accumulated review experience. Secondly, responsible lawyers or retired civil and commercial case judges and arbitrators can be introduced into the company to manage LPPL risk review cases. All levels of the organization should be included, from the head office to branches and sub-branches. Responsible persons and contacts should be appointed at all levels and according to the corresponding LPPL underwriting authority. In principle, each provincial-level business organization should appoint a responsible person and several contacts for post-insurance management. The responsible person may also serve as the contact person. For provinces or regions with large business volumes, appointing multiple contacts for each region is recommended. The post-insurance management contact should regularly track and carefully record the progress of underwriting cases. They should pay special attention to whether the pre-trial applicant for preservation has filed a lawsuit after the preservation measures had been taken; whether the type of the property being applied for preservation was inconsistent with the actual property being preserved, and; whether there is an issue of over-valued preservation. For major and complex cases, representatives should attend the original trials to stay up-to-date on the progress of the cases as much as possible. If the applicant for preservation loses or withdraws the case, the follow-up should focus on the possibility of the respondent’s counter claim. For major and difficult cases in which the applicant for preservation loses or withdraws the case, legal professionals should be asked to make a legal risk assessment on whether there is a “wrongful preservation” in the original case, to prepare for the response as soon as possible. If the removal of preservation should be applied in a timely manner in accordance with the law, as described in the second part of this article or in other high-risk situations, the post-insurance management contact should immediately remind the insured and, according to the agreement of the insurance contract, request the insured to follow the insurer’s professional advice and take timely measures to reduce the probability of the occurrence of wrongful preservation or minimize the loss. Post-insurance management responsible persons are responsible for the organization and coordination of post-insurance management in their respective regions, as well as guiding and training fellow contacts. Seemingly high-risk or irregular cases should be reported immediately to the post-insurance responsible person in the head office, and necessary risk control measures taken in a timely manner under their guidance. In cases where the respondent has filed a claim for wrongful preservation, the claims department should be immediately notified, and the external lawyer entrusted to actively participate in the legal defence of the claim to reduce the loss as much as possible, based on a comprehensive legal risk assessment of the claim. We understand the implementation of such a risk management mechanism needs time and people and it may not be realistic for all LPPL policies. However, we believe that it is an important undertaking for insurance companies, particularly for large and/or complex cases. At present in judicial practice, the court requires insurance companies to issue an Insurance Policy Letter of Undertaking or a Letter of Guarantee, which requires unconditional joint liability for wrongful preservation. The legal nature of the Insurance Policy Letter of Undertaking or the Letter of Guarantee essentially equals the “Independent Letter of Guarantee” in the insurance industry; therefore, insurance companies should not invoke the agreement of the insurance contract against the respondent’s claim for damages. In order to protect its own rights and interests, an insurer should list in the insurance clauses the obligations that the insured (i.e., the applicant for preservation) should perform. If the insurer is liable for compensation because the insured fails to perform these obligations (or performs them insufficiently), after paying compensation to the respondent, the insurer has the right to request the insured pay the corresponding indemnity. The insured shall provide authentic relevant materials, shall not fabricate or conceal facts or falsify or alter evidence, and shall not partake in malicious collusion or false litigation. The insured shall inform the insurer of the progress of the disputed case stated in the insurance policy within a time limit from the date it knows or should know it. The insured shall provide relevant materials submitted by the defendant concerning the disputed case stated in the insurance policy according to the insurer’s request. The insured shall actively perform the rights of litigation or fulfil the litigation obligations to avoid negative litigation consequences due to the failure of performing litigation rights. When the insured is sued by the preserved and/or the interested party for the preservation damages due to wrongful preservation, the insured shall promptly notify the insurer in writing and shall respect and adopt the insurer’s defence opinions on the litigation; and so on. In addition, there is a trend in the market for LPPL clauses to be used to underwrite the risk of property preservation under arbitration. Here, the insurer needs to be reminded that the current LPPL policies of many companies are generally defined by the insurer as “civil litigants or interested parties” who apply for property preservation to the court due to civil disputes, but do not include the parties of the arbitration. Similarly, with LPPL, the source of the insured property preservation is also limited to pre-trial preservation or in-litigation preservation and does not include pre-arbitration preservation and in-arbitration preservation. If the risk of arbitral property preservation is directly underwritten within LPPL insurance clauses, there will be a problem of inconsistency between the insurance clauses and the underwritten risk. This will involve a considerable compliance risk and cause reinsurance recovery problems. We have noticed that some insurers have developed and are marketing separate “Arbitration Property Preservation Liability Insurance (APPL)”. With these products, proper risk control measures should be taken against high-risk factors inherent in the arbitral procedures, such as foreign-related arbitration and invalid arbitration, which are different to litigation procedures. Establishing a comprehensive full-process legal risk management mechanism is crucial to the healthy long-term development of LPPL insurance. This requires the involvement of LPPL professionals who can ensure that insurers properly understand and manage their risks. Only then will LPPL better meet the needs of judicial practice and thus make a positive contribution to building a society ruled by law. Frank Wang, “Litigation Property Preservation Liability Insurance Under the New Rules of Property Preservation”, Casualty Matters China, Gen Re, February 2017. Frank Wang, “Critical Thinking on Litigation Property Preservation Liability Insurance – From the Perspective of Insurance Company’s Risk Management”, Casualty Matters China, Gen Re, May 2016. Gongjian, Zhan and Yu, Pan, “Research Report on Risk Analysis and Normative Development of Litigation Property Preservation Liability Insurance Business”, Fujian Insurance Network, 17 April 2018. Reviews new liability developments affecting General Liability, Commercial Umbrella, Workers' Compensation and Personal Umbrella business. We provide perspectives on what the developments mean to insurers and specific types of insureds.